First Chatham Bank, Savannah’s locally owned and operated community bank, announced today that Kenneth R. Farrell has been elected President & Chief Executive Officer of the bank. With a career spanning over 40 years, Farrell joined the Bank as Executive Vice President and Senior Credit Officer in 2006, following an executive tenure with Barnett Bank and later Bank of America. 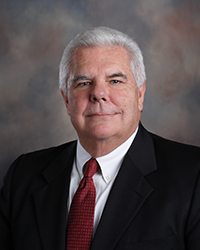 Most recently Farrell served as Interim CEO during a transition period for the Bank. A graduate of Florida State University, Farrell has been involved in numerous community and professional organizations throughout Southeast Georgia including the United Way, YMCA of Coastal Georgia, Jekyll Island Foundation, Boy Scouts of America, College of Coastal Georgia Foundation, Executive Association of Savannah, Savannah Chamber of Commerce CEO Council and Rotary International. He has also served as the Chairman of the Glynn County Development Authority and was a 2001 graduate of Leadership Georgia. In his permanent role, Farrell will be responsible for the day-to-day management of the bank, its overall financial performance and its long-term growth strategy which includes the banks successful SBA Lending function. Farrell will continue to lead the company as it delivers on its mission of building customer relationships through integrity and trust. Farrell, and his wife Vonny, have two grown children and four grandchildren. They make their home in Chatham County. The First Chatham Family of Banks is pleased to introduce EnFact, a text messaging service to alert customers of any suspicious or fraudulent activity with their accounts. Please be assured, this message is legitimate and is coming from the new service in which the Bank is offering to our valued customers. This service is ideal for those customers who want to take an active part in monitoring the transactions on their account. Anytime there is questionable activity, they will be alerted via text. It’s that simple! Although there is no obligation to participate, we strongly encourage our customer to take advantage of this exciting new service! First Chatham Bank Joins New ATM Network! The First Chatham Family of Banks is proud to announce that we are now part of the Presto! Network of ATMs. In addition to any FCB ATM, our customers can now enjoy cash withdrawals, balance inquiries, and account transfers, all SURCHARGE-FREE, at more than 1,100 Presto! ATMs conveniently located at any Publix Super Market. For more information, please visit their website at www.publix.com/presto. This new partnership adds additional banking locations throughout our community and adds convenience for our customers! We are True Community! The First Chatham Family of Banks is pleased to announce our recent upgrade to Retail Online™ Version 5.1. Current login credentials and security questions will remain the same. Updated Login Page – The sign-in process is streamlined with all log-in activity located on the homepage of FCB’s website, thus allowing more convenience and simplicity to our customers. Simplified Homepage – Presenting the most commonly used functions at login makes it easier and more efficient for our customers to bank online. Customers can now easily access account balances, transfers, recent transactions, and bill payments right from the home screen. The presentation of transactions from newest to oldest without having to select current or previous statement makes it easier to review and monitor transaction activity. Intuitive Navigation – All features including transfers and transaction activity, are now part of a single customer experience. Managing activity from one page makes finding and performing transactions faster and more efficient. Transaction History Layout – Combining transaction history onto a single page/view makes it easier for customers to find, view, and track activity. Simplified and Improved Transfer Feature – Customers can now access the express and scheduled transfers within the same workflow, enabling quicker initiation of one-time and recurring transfers. Bill Pay Integration – Bill Pay no longer launches in a second browser window, providing convenience and more security to our customers. Responsive Design – Responsive design provides an optimal customer experience on a tablet, phone, desktop or laptop, regardless of screen size, resolution, and orientation. Our customers can now do their banking anytime, anywhere, on any device. End User Guidance – Provides additional detail our customers may need to perform functions like ordering checks and making stop payments. If you have any questions regarding the new Online Banking version, including access ID and password issues, please contact your local branch. Contact information can be found here: branch locations. The First Chatham Family of Banks is pleased to introduce CardValet®, a mobile card management application that helps reduce fraud by allowing cardholders to monitor accounts with their smartphone and control how, when and where their debit card is used. CardValet is also ideal for small businesses. All transactions can be monitored or controlled for specific merchant categories, such as travel, restaurants or entertainment, and can be denied or reported for types of merchants deemed not business-related. “CardValet is ideal for users who want to actively manage their cards. CardValet’s inventive and thoughtful approach to card management makes the user experience as easy as possible,” said Sharon Spradley, Retail Banking Services Manager. "We are excited to offer this tool to our cardholders! Not only is CardValet user-friendly and convenient, but it will aid in our continued efforts to prevent fraud and identity theft for our cardholders."